If human-created objects of art are historically contingent, then the emergence of (social) network art may be seen as a product of several trends: the broad self-expression and social sharing on Web 2.0; the application of network analysis and data visualization to understand big data, and an appreciation for online machine art. Social network art is a form of cyborg art: it melds data from both humans and machines; the sensibilities of humans and machines; and the pleasures and interests of people. 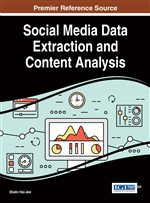 This chapter will highlight some of the types of (social) network art that may be created with Network Overview, Discovery and Exploration for Excel (NodeXL Basic) and provide an overview of the process. The network graph artwork presented here were all built from datasets extracted from popular social media platforms (Twitter, Flickr, YouTube, Wikipedia, and others). This chapter proposes some early aesthetics for this type of electronic artwork. The sense of pleasure is not a purely selfish (psychologically egoistic) one but may be social—with a desire for the pleasure of others. Emile Durkheim (1912) alluded to this in his classic work Elementary Forms of the Religious Life in which he described the sense of exaltation that may occur of people in the presence of others that may lead to a heady religiosity and ultimately a shared understanding of socially normed values. An idea of pleasure as “the basic ethical or normative value” still is defensible into the present even as it has resonated for centuries (Mendola, 2006, pp. 441 - 442). One pleasure-giving artifact that has been a “cultural universal” through all known human societies and cultures is art, which both entrances the senses and the mind. Art is thought to inspire people to creativity. “High-quality, beautiful physical objects act as an ongoing, stimulating background against which intellectual growth can take place,” particularly with the enablements of computers (Eisenberg & Buechley, 2008, p. 3). Aesthetics refers to concepts of beauty and art. According to various philosophical concepts, aesthetics comes in part from biology, from acculturation, and (individually and collectively) lived experiences. Modern aesthetics draw in yet other features of “art” such as a diversity of philosophies, sensibilities, cognitive and sensory evocations, and language (Koren, 2010, as cited in McCormack, 2013, pp. 7 – 8). Aesthetics is experiential and comes from an attentively and appreciatively lived life.